Monitor Power Saver utility that helps user to turn off the Desktop or Laptop screen whenever user lock down their system. Allows you to schedule your computer to hibernate, stand by, restart, or shutdown the computer in a definite period of time. 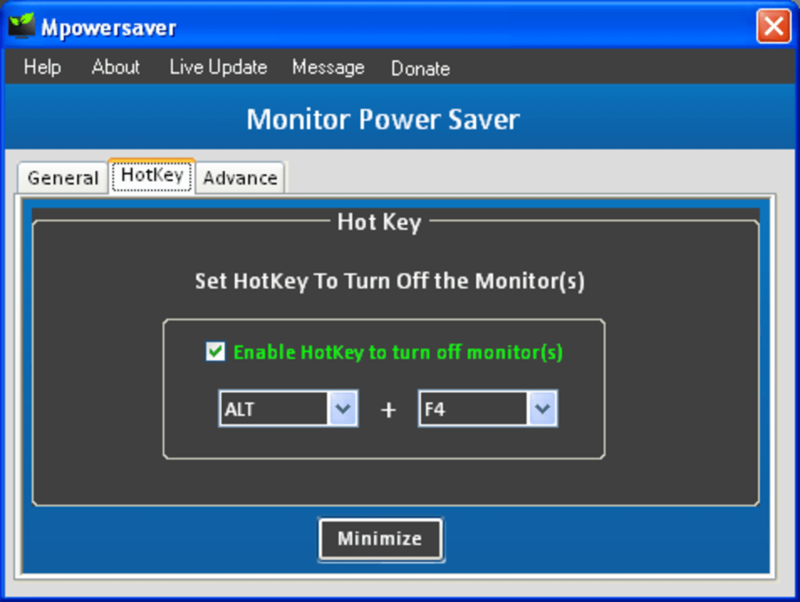 Mpowersaver utility that helps user to turn off the Desktop or Laptop screen whenever users lock their machines or by pressing a hotkey. 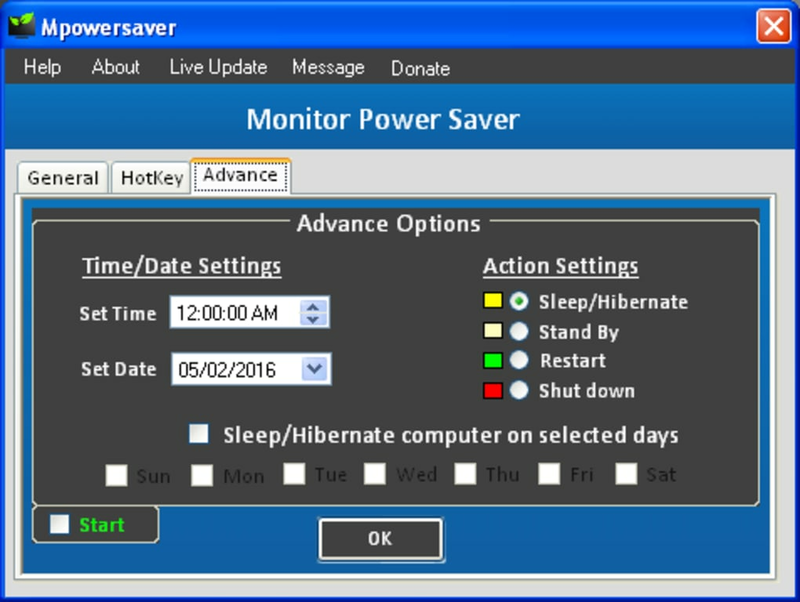 Mpowersaver also allows you to schedule your computer to hibernate, stand by, restart, or shutdown the computer or laptop in a definite period of time. --Automatically Turn off the monitor when user lock down their system (Win +L). --Automatically Turn off the monitor with screen saver starts. (Click check box to activate). --Automatically Lock and Turn off the monitor when system is in inactive mode. (Set time to activate). --Automatically Turn off the monitor when system is in inactive mode. (Set time to activate). --Check the **Enable Hotkey to turn off monitor(s)** to enable the Hotkey, uncheck it to disable it. Select the key combination that you would like to assign to turn off the monitor. -- Daily basis:- For example, let’s say you want to set your computer to shutdown in fifteen minutes. First select the Action Settings (Sleep/Hibernate, Standby, Restart or Shut down), then set the time and date. Once that is complete you must click the (Start) check box and click (OK) button. -- Weekly basis:- For example, let’s say you want to set your computer to shutdown every day at 11:00:00 PM. First select the Action Settings (Sleep/Hibernate, Standby, Restart or Shut down), then set the time. Once that is complete you must click the (Shut down Computer on selected days) check box and select the days (Sun, Mon, Tue.Wed, Thu, Fri, Sat) you want to shutdown your computer, and click the (Start) check box and click (OK) button. 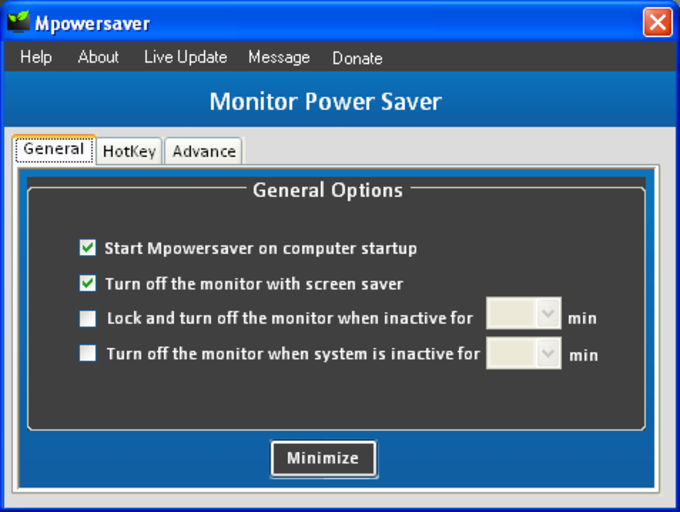 -- Mpowersaver Works With Desktop (Single/ Dual) Monitors and Laptop. -- Mpowersaver Works With Windows 10, Windows 8.1, Windows 8, Windows 7, Windows Vista, Windows XP. I really want to say thanks to developer who developed such a great utility. What do you think about Monitor Power Saver? Do you recommend it? Why?